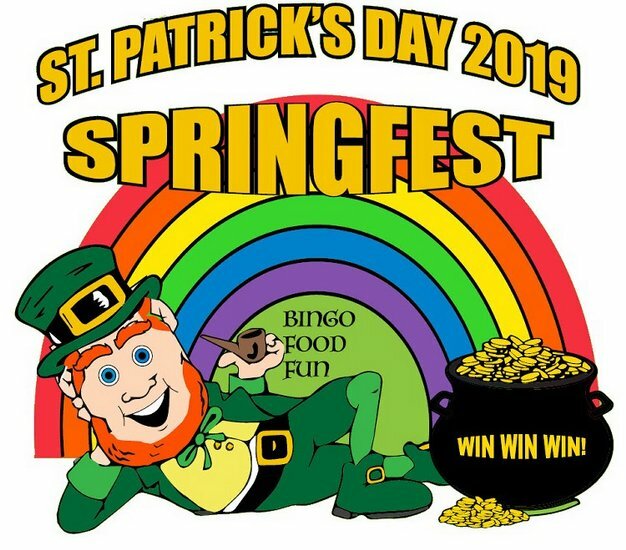 Springfest 2019 will begin on Sunday, March 17 at 11 a.m. and the fun will continue until 3 p.m.
Our parish benefits tremendously from the sale of Raffle Tickets at Springfest. Our grand prize is $2,000 and we will have 10 second prize winners of $100 each. On Springfest day beginning at 1 p.m. in the St. Joseph Hall, Springfest attendees will hear the names of winners drawn every 15 minutes. Each of these winners will be the winner of $100 cash! Ticket prices are $1 each, 6 for $5 or $10 for 12 tickets. Our top ticket sellers also get cash prizes. Click here to learn more about our incentive program and to see our champion ticket sellers. Once again the ever-popular cake booth will be in full swing at Springfest. It's so much fun to win a cake and even more fun bringing the delicious cake home and sharing it with your family. For those donating cakes this year, cake boxes for the cake booth will be available soon after the weekend Masses. Please plan on dropping off your fully prepared cakes on March 17th after 8 a.m. (or March 16th after the 4 p.m. Mass). Trash and Treasure: Shop indoors in our gym as we present this huge yard/crafting sale. Sale begins on Friday, March 15th and runs through Springfest Day. Click here for more information. BINGO: Yes, Bingo is back! Play begins at noon in St. Joseph Hall and will continue until the auction begins. You may enjoy a meal while playing bingo or eat and then begin winning! Returning Auctioneer: We are pleased to announce that we will be featuring Mrs. Faith Harper to serve as auctioneer. Our auction will feature an array of valuable gift baskets sponsored by different groups in the parish and Father Vernon. You're sure to enjoy the banter at the live auction, and if you're lucky enough to win one of these items, you'll go home very happy! Auction packages may be viewed here. Children's Games: The ever popular Children's Games will be back and this year. New this year? We will have our inflatables in the gym and other fun games for the children to enjoy. Armbands for the inflatables are $5. New Menu: The food offerings for Springfest 35 will be pleasing to the palate! Make certain to invite all your friends to join us and enjoy either a fried catfish or chicken wing plate! Checkout our menu/prices by clicking here. Win a Gun: Knights of Columbus Council 10567 is sponsoring its first annual Charles L. Blanchard gun raffle. Click here for more information. Vendors: We have a number of vendors who will be promoting their goods and services. Click here to go to the list and get more information. Many are being added so check back often to get updates! You can volunteer to work prior to Springfest and on Springfest day. Please complete our online form by clicking here. As always, help us to promote Springfest by sharing the event on social media and by posting our flyer at your place of business. Let's make this the best Springfest ever. Photos from Springfest 2016 may be found here.